There are a few comments I am obliged to offer knowing, from experience, verbal communication is a minefield for the visual artist to casually stroll through without a stick; the longer the stroll the more likely the work becomes secondary to something else. Accordingly, I have this page 'edited down' as much as possible. Working in several media affords me a wide range of creative possibilities in my predominately narrative images. An idea which begins as a silver print photograph can be further explored through other media and vice versa. When I use digital media it is in support of my decisions rather than my following a limited algorithm offered by a program. This is consistent with my experience in photography where exposure and process controls, rather than 'automatic' features, expand the creative choices. 'Choices' and 'possibilities' are central to my creative concerns. My religious faith and religion's significance in all cultures are among thematic concerns currently being explored. The contemporary relationships between religion and art presents formalistic challenges in a world where political ideology either denounces religion or cloaks itself with religion to validate a tyranny. 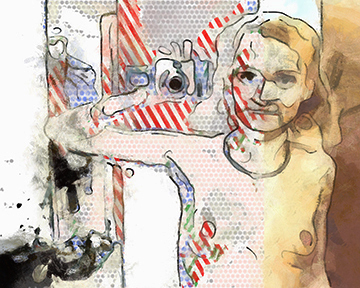 Technology's effects on personal and social life are also ongoing visual narratives. The 'selfie' phenomena in social media provides visual content as well as psychological issues. The isolation of people due to technology's constant presence is another narrative being explored. All images are created by me - no sub-contracting or collaboration- and I use only materials meeting museum archival standards. I make art to hang on walls. The work is pricey. Price and ownership are commitments for the less timid and those willing to support art.